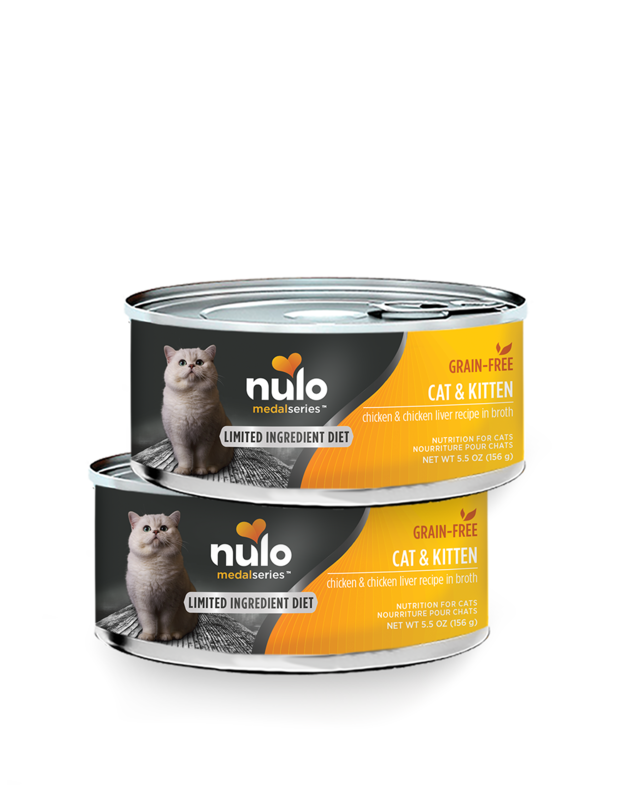 Nulo MedalSeries Limited Ingredient Diets are an excellent choice for cats preferring a simplified diet. With 95% Chicken and Chicken Liver, this recipe is designed to give your cat more of what they crave, and less of what they don’t. Complete and balanced for all life stages of cats and kittens, this recipe can be fed as a meal, or as the perfect pairing to Nulo’s Whole-Prey Limited Ingredient Diet kibble recipes. Chicken, Chicken Broth, Chicken Liver, Ground Flaxseed, Cassia Gum, Agar-Agar, Salt, Calcium Carbonate, Choline Chloride, Potassium Chloride, Inulin, Taurine, Zinc Sulfate, Ferrous Sulfate, Yucca Schidigera Extract, Vitamin E Supplement, Manganese Sulfate, Copper Sulfate, Sodium Selenite, Thiamine Mononitrate, Niacin Supplement, Calcium Iodate, Vitamin A Supplement, d-Calcium Pantothenate, Pyridoxine Hydrochloride, Riboflavin Supplement, Vitamin D3 Supplement, Folic Acid, Biotin, Vitamin B12 Supplement. MedalSeries Canned Limited Ingredient Diet Cat & Kitten Chicken & Chicken Liver Recipe is formulated to meet the nutritional levels established by the AAFCO Cat Food Nutrient Profiles for all lifestages.